One of the great things about Dynamite’s various books is that they are so damn approachable, even for pulp characters or characters with long histories in the printed media. Sure, Kings Watch is set sometime after the events of Defenders of the Earth or is part of that continuity at least, but at no point does it feel like I’m reading something deep in a particular continuity. This issue doesn’t depend on the reader being intimately familiar with the characters involved. You just need to have a basic idea of the characters, and that’s that. Anything else happens over the course of the issue and it all reads pretty fluidly. There’s a mystery in space, some kind of an aurorae that is causing psychological havoc on Earth and pretty much just screwing around with peoples’ daily lives. In the midst of it all, we have the Phantom fighting strange new creatures in Bengalla, Flash is building a space-plane to take him to (well…) space and investigate the phenomenon, and Mandrake turns to an imprisoned demon in his mansion for answers to what the hell is going on. 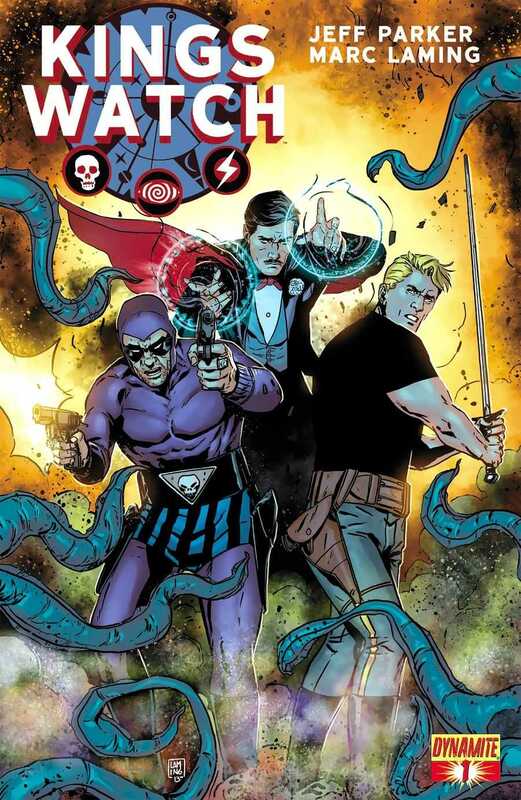 In a series of quick pages, writer Jeff Parker does an excellent job of introducing all the characters, and then giving them something to do, particularly Phantom. Jeff Parker, because of his work on Batman ’66 and Aquaman, has quickly become one of my favourite writers and with this issue he has only cemented my loyalty further. It was great to see all this characters back in action after so many years, almost like 18 years or something, maybe more. Phantom got some awesome kickass scenes in the second half of the book and Flash was quite heroic in his own way while Mandrake was mysterious as always. I get the sense that Jeff does understand these characters very well, and honestly, after having seen proof of it, I wouldn’t want any other writer on this, because this is just perfect. Or as close as you can get to that. There are some other characters in this of course, characters I don’t quite recognise except for Lothar, but Jeff doesn’t write them in so that the reader is confused as to what is going on. Far from it in fact. He is building up a mystery, setting it all up with this issue, and that I definitely understand. He made me care for even the secondary characters, and that’s awesome. The art, with pencils by Marc Laming and colours by Jordan Boyd and letters by Simon Bowland, is also pretty much perfect. There’s a bit of a rough look to this issue that I think is quite intentional, given the story, I do like it. In particular, Laming’s characters are quite expressive, especially in their faces, and that is doubly great because this is a story that does require the characters to be as such. And there is a great range here too, especially with the trinity characters. Flash’ flamboyance, Phantom’s calm reserve and outright fury, Mandrake’s grim countenance, Laming gets it all. And Boyd’s colours are always spot on too, really helping to make the material rise above itself. For my money’s worth, this was a damn fun read and I’m going to try and read the next few issues soon as I can. Posted on February 26, 2014, in Comics Reviews, Review Central and tagged Comics, Comics Review, Defenders of the Earth, Dynamite Entertainment, Flash Gordon, Jeff Parker, Jordan Boyd, Kings Watch, Lothar, magic, Mandrake, Mandrake the Magician, Marc Laming, Monsters, Phantom, Pulp Comics, Review, Review Central, Science Fiction, Simon Bowland, Space Anomalies, The Phantom, Urban Fantasy. Bookmark the permalink. 3 Comments.